What’s Driving Retirement Plan Access? Most workers who are likely to have the ability to save and who are focused primarily on saving for retirement have access to an employer-sponsored retirement plan—and nearly all of these workers choose to participate. A new research paper from ICI, Who Gets Retirement Plans and Why, 2013, shows that seven in 10 workers most likely to be saving for retirement—workers aged 30 and older with at least moderate levels of earnings, and all but the lowest-earning workers aged 45 and older—work for an employer that sponsors a retirement plan. If workers whose spouse has access to a plan at work are counted, a full three-quarters have access. And 93 percent of workers with access to a plan, either through their own employer or their spouse’s, participate. The new research paper finds that the characteristics of a firm’s workforce heavily influence whether it sponsors a retirement plan. Firms are more likely to offer a plan if their workers are focused on saving for retirement and thus value compensation packages that include retirement benefits. 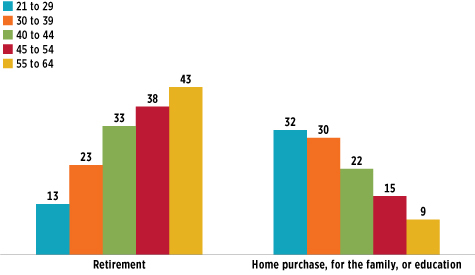 As the figure below shows, younger households are more likely to save primarily for reasons other than retirement, such as a home purchase, family needs, or education. The tendency of younger workers to focus less on saving for retirement is consistent with economic models of life-cycle consumption predicting that most workers delay saving for retirement until later in their careers. Similarly, lower-income households also focus less on saving for retirement, reflecting the fact that Social Security benefits replace a higher share of pre-retirement earnings for workers with lower lifetime earnings. Older and higher-income households, by contrast, are more likely to save primarily for retirement, as many already have reached their other savings goals. Workers in these households thus are more likely to seek out compensation that includes a portion as retirement benefits rather than only cash. Consistent with these savings preferences, the younger, lower earners—who are less focused on saving for retirement than the older, higher earners—also are less likely to work for an employer that offers a retirement plan. In 2013, for example, just 43 percent of workers aged 21 to 29 worked for employers that sponsored retirement plans, well below the 60 percent of workers aged 55 to 64 who did. In addition, 26 percent of workers in the lowest quintile of annual earnings ($15,000 or less) worked for employers that sponsored retirement plans, barely a third of the 75 percent of workers in the highest quintile ($65,000 or more) who did. Policy discussions surrounding retirement have long focused on the fact that about half of American workers at any one time have access to an employer-sponsored retirement plan. But a snapshot of retirement plan coverage misses the big picture. The overall percentage of the workforce with access to an employer-sponsored retirement plan today understates the share of workers who will reach retirement having accrued employer-provided retirement benefits. Young workers do not remain young throughout their careers, nor do all low-income and part-time workers remain low-income and part-time. Many workers who do not have access to an employer-sponsored retirement plan today will have access to one before they retire—either through their own employers or their spouses’. By the time they reach retirement, the vast majority of American households will have accumulated retirement assets, accrued retirement benefits, or both. And still more can be done to increase access to employer-sponsored retirement plans. Careful analysis of the data, however, suggests caution when proposing reforms to a system that already provides retirement benefits to most workers who are focused on saving for retirement. Peter Brady is a senior economist at ICI. The International Monetary Fund (IMF) just released its latest Global Financial Stability Report. In the immortal words of Yogi Berra, it is déjà vu all over again. The IMF report bears more than a passing resemblance to Asset Management and Financial Stability, published by the U.S. Treasury Department’s Office of Financial Research (OFR) in September 2013. The OFR report was met with widespread criticism for its misinformed discussion of hypothetical “vulnerabilities” posed by mutual funds and other asset managers.